“Govt will facilitates for preservation of cultural identity and to keep alive the age old culture & traditions of tribal communities” said Chowna Mein, the Deputy Chief of Arunachal Pradesh while attending the Longte Festival at Nyokum Lapang here today. He said that for the purpose of preservation and promotion of rich culture & traditions, Govt has kept fund provision in this year’s budget. He also said that Rs 1 Crore was allocated in the department of Research last year for documentation of indigenous healing systems and urged the department to utilize the fund purposefully. He further stated that there is huge scope for cultural tourism and village tourism in Arunachal Pradesh due to its lush greenery and scenic beauties which also provide lots of scope for film shooting in the State. He invited the guests from the Indian cinema who were present in the festival, all time entertainer and film actor, Shakti Kapoor and film director, Shiraz Henry to come and shoot more films in the State. He asserted that if tourists can go to desert places, why they can’t come to Arunachal Pradesh? Where there is pleasant and lush green environment. He lauded the Bollywood Superstar, Salman Khan for promoting Arunachal Tourism by releasing a video in YouTube which he had done pro bono wherein he showcased the scenic beauty and tourism potential of the State and appeal the peoples from other parts of the country to visit this beautiful State through his video. Minister of Tourism, Jarkar Gamlin while emphasizing on preservation of age old cultures & traditions termed the Longte Festival a unique festival, an environment friendly and a wildlife friendly festival as it is being observed without slaughtering and sacrifice of animals and birds during and after the rituals. Lauding the Nyishi community for this innovative idea, he urged the other tribes to learn and emulate from them. He further expressed hope that the community would come out with more innovative ideas by adopting the good ones and discarding the bad ones for every one to follow. 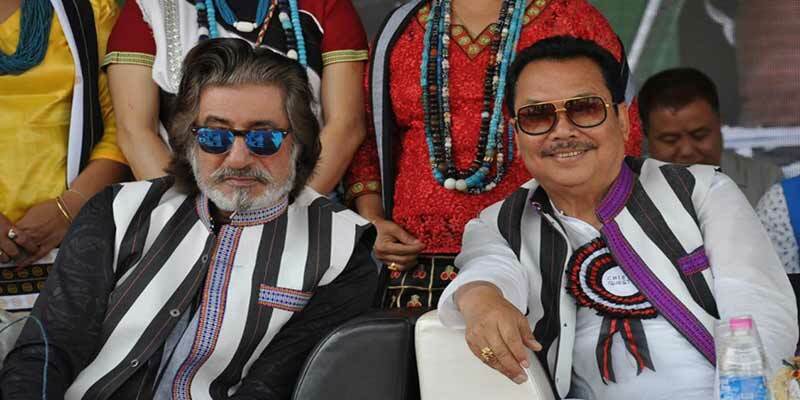 Bollywood actor Shakti Kapoor, who was a special invitee in the festival while lauding the scenic beauty of the State said, “if there is a paradise on earth, it is Arunachal Pradesh”. He lauded the motto of the Longte Festival which is mainly observed to protect the crops from cattles by erecting barricades and to offer prayer to the deity for healthy crops and bumper harvest. He also appreciated the local film producer, Yumlam Achung for his new forthcoming film, “The Little Boy” directed by Shiraz Henry and requested the State Govt to encourage such film makers from the State. Kapoor was accompanied by Film Director, Shiraz Henry, Film makers from the North East, Miss Rebecca and Mr Rakesh. Chairman, Festival Organizing Committee, Yumlang Achung and General Secretary, Organizing Committee, Pani Tare also spoke on the occasion. Earlier the chief guest and guest of honour were given a warm reception with Reekam Pada. The guests also participated in the ritual of erection of barricade ‘Longte Lemin’ at Longte Longbe. Mega dance, kids group dance and group song were also presented on the occasion.